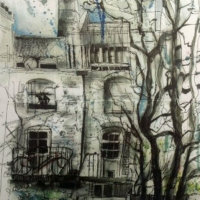 Following a long career in Arts Education, Carmen Renwick works in a variety of Art media: painting in Acrylic, watercolour and mixed media as well as pen and ink studies, pencil sketches and printmaking. Carmen is inspired by the dramatic natural structures of trees, flowers, hills, mountains and seascapes. She uses motif and pattern to simplify forms; much of her work is semi-abstract, enhanced by lively line quality and a very individual colour palette.